Today is the 7th day of May 2014 and we are here in Paris at the Maison de la Mutualite where Huawei is launching the newest device of 2014. This is the flagship device of the year and is a followup og the Ascend P6 launched last year at around the same time. Paris, France is rather new ground for Huawei to launch at and this naturally would evoke questions as to why it’s different this year. A Huawei insider hinted that one of the reasons is that Huawei intends to target the developed European market with the new smartphone proposition. Paris is the fashion capital of the world and Huawei Ascend P7 has design among the key selling points of the device.This is also another reason, to theme it alongside design in the design capital, something that Huawei has managed to do quite well. Huawei ascend P6 unveiled last year has become one of the best selling smartphones for Huawei. Huawei has moved to the global number 3 in smartphones, and Huawei won’t stop there, they are investing a lot in product and R&D. 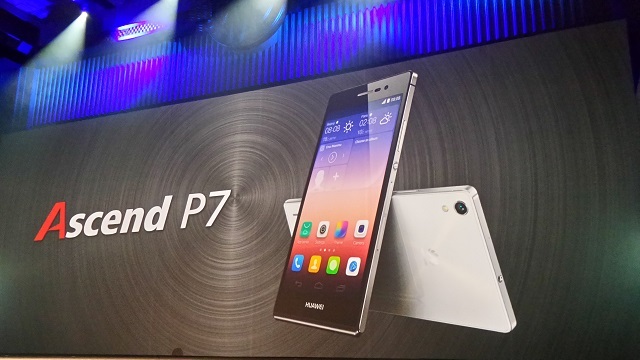 Thus the company has quite high expectations for the Ascend P7. According to Richard Yu, Huawei Device Chairman, Huawei consumers are young innovators and the three key tag lines for Huawei P7 are redefining craftmanship, redefining camera experience, redefining connectivity. Huawei is the largest supplier of 4G in the world, Ascend P7 comes running 4G supporting all global bands and frequencies. There is no word yet as to pricing or when it hits the market but we’ll update you as soon as this is available. UPDATE: Huawei Ascend P7 will retail at EUR 449 and will be available in 30 countries including all Orange shops in Europe from 7th of June. This translates to around Kshs 54,000 in Kenya. Expect it in Kenya within a month too with interesting bundling from Safaricom.